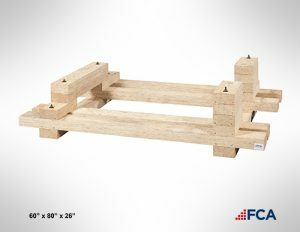 FCA Packaging manufactures custom industrial skids designed for the safe storage and transport of products of any size. Our customs skids are designed to the exact specifications of your products, taking into account the unique requirements of your supply chain. With over 25 years’ experience and with a location near you we can work with you to create a custom skid that is durable and cost effective. OEMs turn to FCA Packaging for custom packaging for industrial engines, turbines, generators, components and spare parts. We custom design and build skids out of wood, steel, as well as hybrid materials. They can be designed to withstand multiple uses over time, helping to lower your overall operating costs. We’ve designed skids to protect highly sensitive products up to and including custom skids capable of transporting 50,000-pound products around the world. Our ISTA-certified testing lab tests and validates our customized wood, steel, and hybrid skids to safe guard the billions of dollars’ worth of product transported on them each yea. 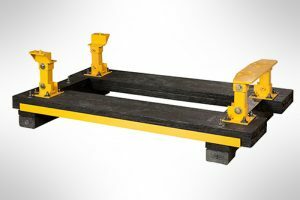 By investing in custom industrial skids for your business, you can maximum profits, efficiency, and success. Call FCA Packaging today for a consultation. Contact our office at (309) 792-3444 or submit a request with our contact form.